Flag of Zimbabue available in 100% Polyester fabric and various measures from 060X100 to 150x300. Particularly suitable for outdoor use and manufactured in European union. This banner was approved on April 18, 1980, after proclaiming the country its independence from Great Britain. During the period of British colonization, the country was called Southern Rhodesia. Until 1968, the flag of Zimbabwe incorporated the one of the United Kingdom in the upper part attached to the mast and the shield of the country in the central right part. In 1968, Rhodesia switched to a vertical tricolor: green, white and green, with the shield in the center. In 1979, and for a short period of time, the badge had three horizontal stripes: red, white and green, plus a black vertical attached to the mast, which included the shield. The current one was approved the following year. 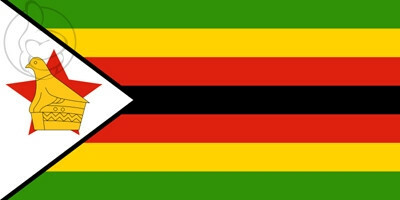 With seven horizontal stripes, the Zimbabwe flag is arranged in this order, from top to bottom: green, yellow, red, black, red, yellow and green, the meaning of which is as follows: green represents the agriculture and rural areas; the yellow, the mineral wealth of the country; red symbolizes the blood shed for freedom, and black symbolizes the heritage of African ethnic groups. In the part next to the mast is a white triangle with a black border that symbolizes peace. Inside is the statue of a bird that represents the history of the country - one was found in the ruins of Great Zimbabwe - on a red star that represents the revolutionary struggle.